Saint Joseph’s University hosted the first annual Jesuit Business Student Alliance (JBSA) Conference in April 2016. 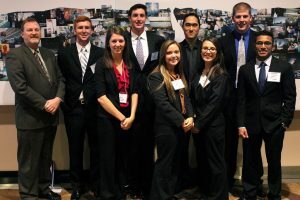 A national networking organization for business students of Jesuit colleges and universities, the JBSA was formalized in 2013 by SJU students in the Haub School of Business and founder Pat O’Brien, HSB associate dean. Students from Georgetown, Creighton, Fordham, St. Louis and St. Peter’s universities traveled to Saint Joseph’s to engage in discussions of ethical business practices and opportunities to network with Jesuit university alumni. Students prepared for the conference with an eight-week online management course, Ethical Practices in Business, which was the guiding theme of their meetings on Hawk Hill. Students delivered their final presentations for the course, taught by Ronald Duska, Ph.D., SJU adjunct professor and executive director of the Society of Business Ethics, at the conference. In addition to McWilliams, Saint Joseph’s student participants included Mark Andrade ’17, Louis Andreacchio ’18, Alexandra Natale ’18, Joseph Quartucio ’16, Elizabeth Raffo ’18 and Alissa Salvitti ’17.